San Francisco, CA, March 12, 2019 --(PR.com)-- Emma, a 7-year old living in San Francisco, California, has received a very special delivery of her very own, an Autism Service Dog from Service Dogs by Warren Retrievers to assist her and help better communicate her needs. 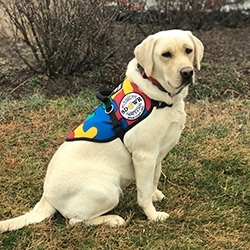 Based in Madison, Virginia, Service Dogs by Warren Retrievers, or “SDWR,” has a mission to provide specially-bred and trained dogs for people with invisible disabilities like Diabetes, PTSD, Seizure Disorders, or in the case of Emma - Autism Spectrum Disorder. SDWR has hundreds of service dogs working across the United States and around the globe. SDWR is currently serving approximately 1,000 families. Carmen, a black labrador retriever Autism Service Dog, recently graduated from SDWR’s Service Dog Raiser Program where volunteers diligently raise young service dogs in training over the course of approximately one year. Both the dogs and raisers must complete the foundation and skill set training provided through SDWR trainers at their facility in Virginia. Carmen is also an honored graduate of the SDWR Fallen Officer Puppy Program. The Fallen Officer Puppy Program, also known as “FOPP,” is an initiative by SDWR to pay respect to the legacy of service by fallen American police who sacrificed their lives in the line of duty. Carmen is named in honor of fallen hero Detective Carmen M. Figueroa of New York City Police Department who died from illnesses she contracted after inhaling toxic materials as she participated in the rescue and recovery efforts at the World Trade Center site following the terrorist attacks on September 11, 2001. Carmen’s work as an Autism Service Dog with Emma will carry on in memoriam of Detective Figueroa’s life of service before self. Emma was diagnosed with Autism at the age of 4-years-old. Emma has sensory sensitivities and struggles with impulse control and emotional regulation when she is overwhelmed or overstimulated. She sometimes engages in risky behaviors when in public. Her family hardly ever takes her shopping or out to eat because the risk of her melting down is too high. One of Emma's biggest struggles is with sleep. She has been seeing a pediatric neurologist since she was 3 years old to sleep better. She takes three medications at night to sleep. Emma’s family is hopeful that a service dog will act as a guardian for her and help keep her safe and comfort her. Carmen will assist in reducing the effects each diagnosis has on the family’s independence and daily life by working continuously with Emma. Since Carmen is a service dog and covered under laws in accordance with the Americans with Disabilities Act, Carmen will be able to accompany Emma and her family everywhere - from school, to dance class, and even to swim practice. SDWR’s unique training program is what sets them apart from other non-profit service dog organizations. SDWR trainers will continue to return for training sessions with Emma, her family, and Carmen every 3-4 months over the course of the next 18 months to continue working on Carmen’s customized training, follow up training and training the human to make a successful team and public access certification. Service Dogs by Warren Retrievers is a nonprofit organization based in Madison, Virginia, and relies on donations to help the organization in its mission, “Until there’s a cure...there’s a dog.” To make or donation or learn more about SDWR, please visit the website, https://www.sdwr.org. To learn more about Autism Service Dogs go to https://www.sdwr.org/service-dogs/autism/. To find out how you can volunteer as a puppy raiser visit https://www.sdwr.org/volunteer-opportunities/.